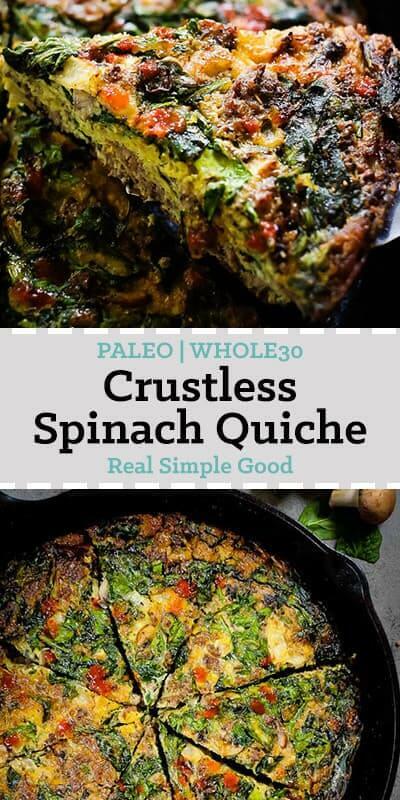 This healthy crustless spinach quiche is a great Paleo + Whole 30 breakfast option! Simple ingredients and easy prep make this the perfect recipe for a Whole30 brunch. 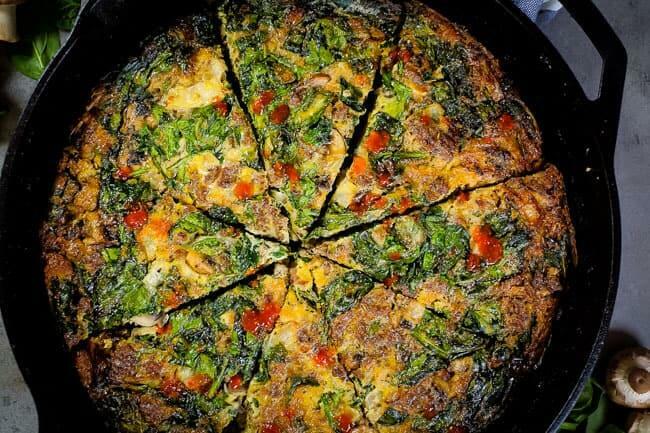 Protein packed and filling, this will be a new go-to healthy crustless spinach quiche recipe! WHO NEEDS THAT CRUST ANYWAY? 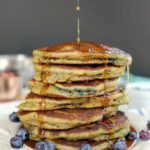 I don’t know about you, but when I’m making a big breakfast or brunch recipe to feed a lot of people, I don’t want it to take me all day long to make! If you are making a traditional quiche, the most time consuming part is usually the crust. Making a crust can be intimidating and I feel like it never quite turns out how you want it. 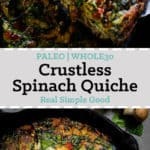 So why not just eliminate it, save some time and make your quiche a little healthier and easier to make? 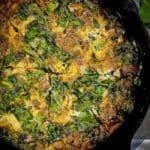 Since this crustless spinach quiche is cooked in a cast iron pan in the oven, it develops a crispy texture around the edges that gives it a bit of a “crust”. 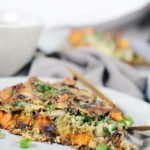 The texture is perfect and you’ll still get the flavor of fluffy eggs and tons of goodies to fill you up! 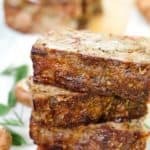 We’ve added breakfast sausage, onions and mushrooms along with some simple spices to go with the eggs and spinach and make this a flavor-packed breakfast. 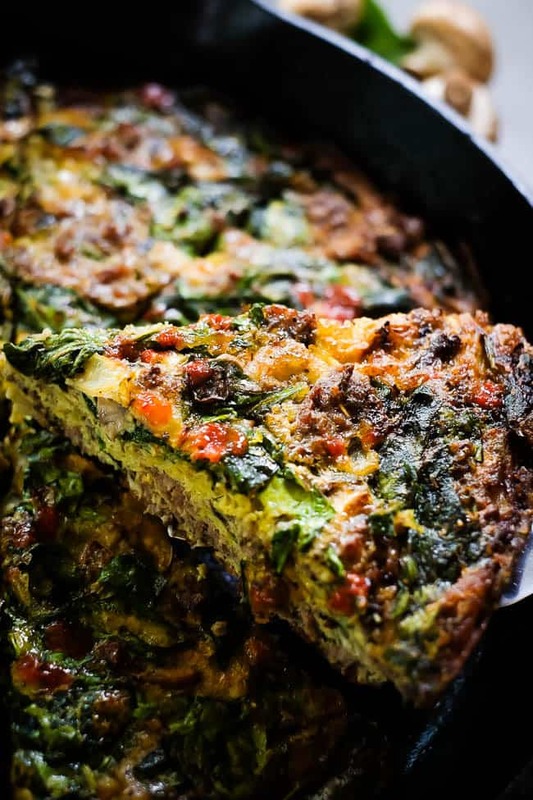 WHAT’S THE TRICK TO A DAIRY-FREE QUICHE? 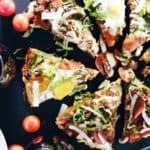 Instead of using half and half and cheese, we use some full fat coconut milk to help provide some of the texture you’d normally find in a quiche. The trick is finding he right amount of coconut milk to fit your taste buds, as the more you add the more coconut flavor you will get. 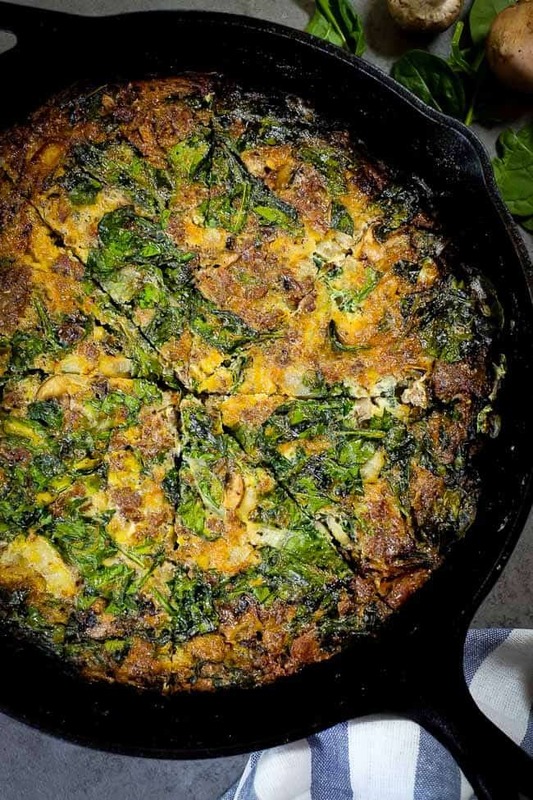 I personally didn’t want this crustless spinach quiche to taste like coconut, so I only used 1/4 cup of coconut milk. 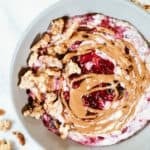 This amount seems to be good to help get a light and fluffy texture but still blend in well so you don’t really taste the coconut flavor at all. 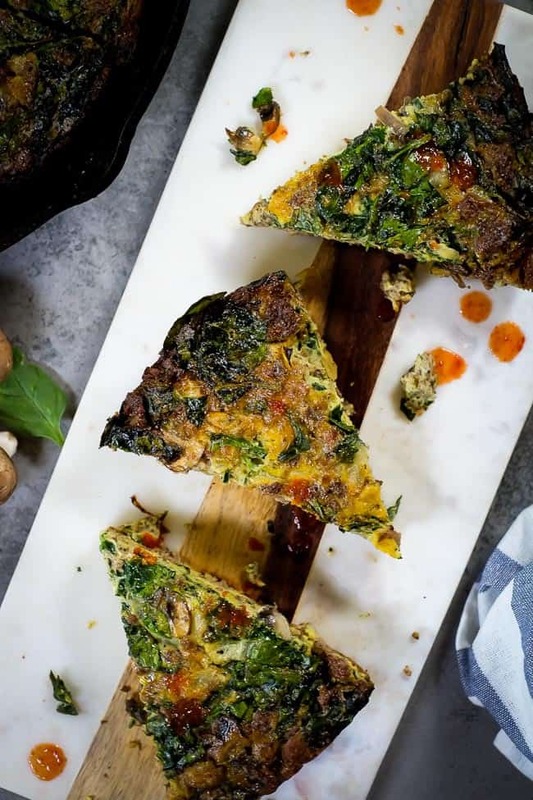 Put this crustless spinach quiche on your list to make for your next gathering or brunch! Your guests will love the flavor and won’t even know it’s packed with veggies and healthy goodies! Let us know how it goes by leaving a comment below. Also, take a photo and tag us on Instagram @realsimplegood, so we can check it out! If you don’t already follow us on Instagram, definitely give us a follow! We appreciate every single like, comment and message we receive! Chop onion and mushrooms as noted. Heat a cast iron pan or other oven safe pan over medium heat. Note: If you don’t use a cast iron skillet, you’ll have to transfer everything to another oven safe dish to do the final cooking in the oven. Add in the sausage and onion to cook, stirring occasionally, until the sausage is browned, about 7-8 minutes. Add in the mushrooms at the end and allow them to cook with the sausage for 2 minutes or so to soften. Remove from heat. While the sausage is cooking, chop spinach. Crack the eggs into a large bowl and add coconut milk (use 1/2 cup for a lighter and fluffier texture, less if you don’t want as much coconut flavor). Whisk together well to get a light egg mixture. Add the spinach and seasonings to the bowl with the eggs. 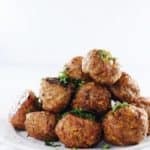 Once the sausage is finished, add the sausage mixture to the bowl with the rest of the ingredients and mix until everything is evenly incorporated. To prevent the quiche from sticking, make sure the pan is lined with some fat from the sausage or greased well with oil, butter or ghee. Then, pour everything back into the cast iron pan (or other oven safe dish). Bake in your oven for 30 minutes, until the egg is set in the middle. You’ll know it is done when the top is looking brown and crispy and the egg in the middle of the pan is no longer runny.